LCD monitors often have a "sharpness" control, which can emphasize or deemphasize boundaries between light and dark areas. Ideally, it does neither, unless you like a bit of fuzziness or like small letters to have more contrast. If the sharpness setting is correct (i.e., neutral), all blocks in the image below will blend in when you look at the screen from a distance or while squinting your eyes. 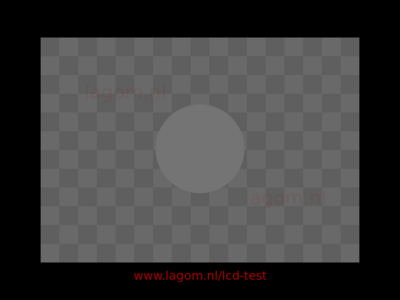 If the gamma of your display is correct as well, then the central disc will blend in, but we will have a better look at this in the next test. If the sharpness setting is far off, you may be able to see fringes around the white and black bars in the center. 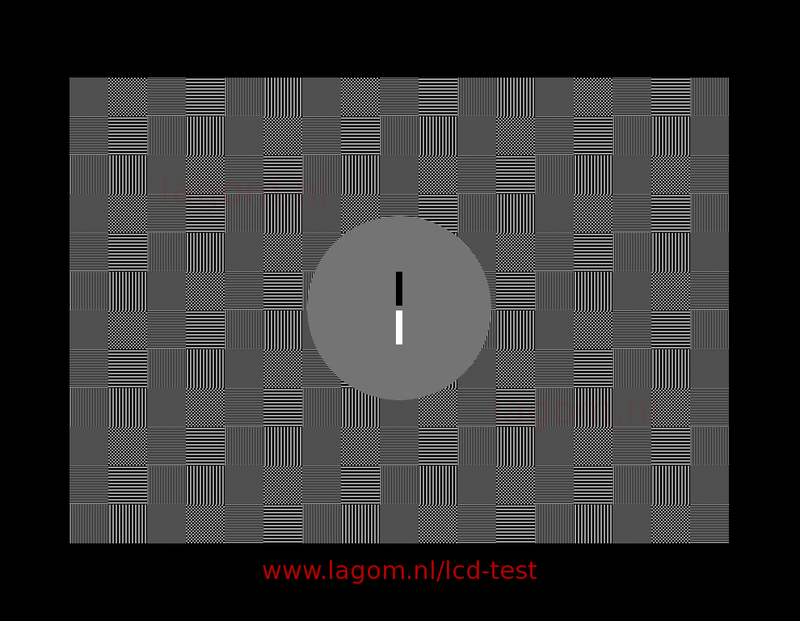 If your monitor is on a VGA cable, you should first make sure that the clock/phase settings are correct (see previous test). Your monitor must be running in its native resolution for this test and the image viewer must not resize the image to fit it on the screen. In any case, if the sharpness setting is not correct, the gamma calibration test will not be meaningful. The sharpness test comes in two versions. 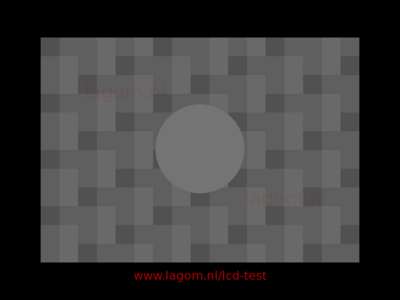 The first variant ("DVI") is with vertical lines and fine checkerboard patterns. The second variant ("VGA") is with only horizontal lines, which should look better than the DVI version, even on monitors that are on a VGA cable. In principle, both versions should look good, even on a VGA connection. Appearance with correct sharpness setting. Left: sharpness and gamma both correct; right: sharpness correct, but not gamma. Sharpness too high; left: DVI version, right: VGA ("striped") version. Sharpness too low; left: DVI version, right: VGA ("striped") version.